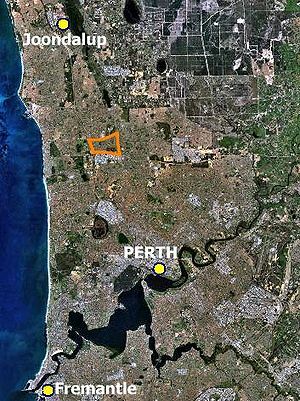 Mooro country is that part of the Noongar country that follows a string of lakes through the western and northern suburbs of Perth and beyond to the Moore River. This afternoon a group of us met with the Northern Suburbs Reconciliation Group and took a bus tour through some of this wetland area, visiting places of significance under the guidance of a local Elder. In pre-colonial times the area was alive with indigenous commerce. As well as bearing a plentiful supply of food and providing hospitable space for camping, corroboree and storytelling, these were meeting places where inland clans and tribal groups could trade commodities with the coastal people. Some of this function continued way past European settlement, and in spite of decimation experienced under attempts by colonisers to move Aborigines from nomadic to agricultural lifestyles. To visit familiar landmarks, even a shopping centre carpark, and have pointed out to us the former culture’s significant places, a memorial stone here, a clump of scar bearing trees there, a main road where bitumen covered a thousands of years old walking track,was like twisting a kaleidoscope to see the layers of ancient folklore beneath the veneer of western suburbia. Incredibly exciting, WonderingPilgrim: the oral tradition is so immediate, and when nothing has been written it doubles as primary evidence. A lovely post. Thank you, Kate. This area is so rich with indigenous history and, following a period of several decades of draconian “assimilation” policies, some of it is slowly being recovered.